For expert and novice anglers alike, the new Brazen Hussy is able to offer considerable space and comfort combined with extraordinary stability and safety, due to her being a catamaran or twin hulled vessel and consequently very broad in the beam. We are available for offshore angling trips covering a big section of the Connemara coast and many of the islands off these western shores. Within our operational area we have a large number of these islands which means many opportunities for undisturbed grounds. They also offer plenty of shelter should it be a breezy day when you are out fishing and losing a day due to really poor conditions is most unusual. Due also to the design of the boat there is a very considerably reduced chance of any tangles with your neighbours. Fishing lines down either side of the vessel are 16’ apart and there is a total fishing length of 74’ available to the angler. With a full compliment of 12 anglers aboard, this gives over 6’ of space between each individual. Our season essentially begins in March and closes during October. The normal period of any daily charter is a minimum of eight hours port to port. The Brazen Hussy normally leaves from our home port of Derryinver near to Letterfrack. From here out to the nearest fishing grounds is a journey of no more than 20-30 minutes, though if reports are good from other areas we are prepared to travel much further. We offer two methods of reef angling, firstly drifting across these reefs or alternatively putting down an anchor. The expected species in these waters are very varied and where on a poor day we may expect an average of 6 species, on a good day we would expect our average to be up to 15 species. Anglers may expect a catch to include anything from the common mackerel and pollock or coley, to cuckoo and ballan wrasse, ling and cod. Also on the rocky areas will be found horse mackerel, poor cod, whiting, pouting and where the reef and sand meet, the greater sand eel and gurnard. When anchoring over reefs one may expect any of the above but will also have the opportunity to catch big conger eel and big ling. 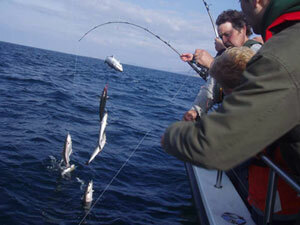 A baited hook with a fillet of mackerel will produce some excellent results. Alternatively if anchored over sand or gravel, one may expect a variety of ray and the possibility of very big skate. One recently caught near to my own home we conservatively estimate as being 280 lbs but as the two gentlemen weren’t able to lift it into their boat we shall never know its true weight. It was tagged and they very properly returned it to the depths, a monster caught in no more than 12 metres of water. Other flat fish that will be found here are turbot, plaice and brill, two or three varieties of ray and while over these areas of sand and gravel one may also expect red and tub gurnard. We had a red gurnard brought on board just recently that weighed 3.25 lbs, a fine specimen fish. Together with these the dog fish, spur dog and in deeper water the smooth hound, bull huss and tope. Should you be travelling light or new to the sport we are able to supply equipment for a modest daily fee. The equipment we have is first class and we turn over our rods and reels on a regular basis keeping this element of the operation in first class condition. If you have particular ambitions to catch a certain species, if you have a group of friends or clients that you wish to entertain, don’t hesitate to discuss this with us and if possible, we shall put into place a plan to realise those wishes. Finally should you need a recommendation for accommodation in this area, let us know what your budget is and we will advise and recommend accordingly.